Many people have strong opinions about genetically modified plants, also known as genetically modified organisms or GMOs. But sometimes there’s confusion around what it means to be a GMO. It also may be much more sensible to judge a plant by its specific traits rather than the way it was produced – GMO or not. This article is not about judging whether GMOs are good or bad, but rather an explanation of how plants with modified genomes are made. 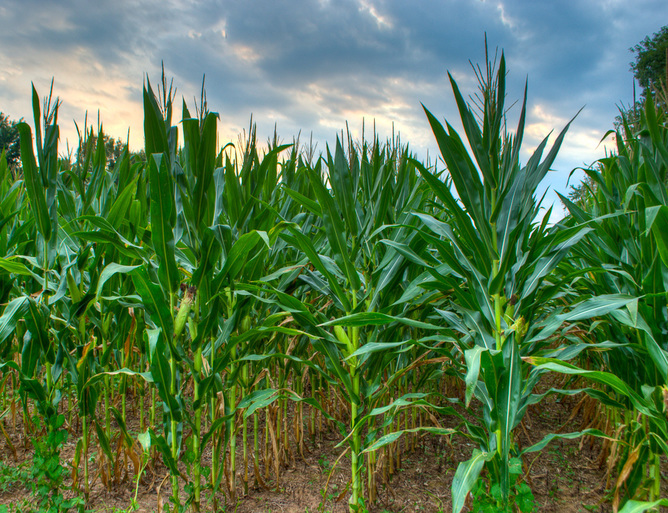 (There are non-plant GMOs, but in this article we will only refer to plant GMOs.) First of all, it’s necessary to define what we mean by a GMO. For the purposes of this discussion, I’m defining GMOs as plants whose genetic information (found in their genomes) has been modified by human activity. If we think of GMOs as plants that have genomes modified by humans, then quite a lot of the plants sold in any grocery store fit that description. But many of these modifications didn’t occur in the lab. Farmers select plants with superior, desirable traits to cultivate in a process known as agricultural evolution. Thousands of years of traditional agricultural breeding has changed plant genomes from those of their original wild ancestors. Wild cabbage doesn’t look much like its domesticated version, broccoli. Broccoli, for example, is not a naturally occurring plant. It’s been bred from undomesticated Brassica oleracea or ‘wild cabbage’; domesticated varieties of B. oleracea include both broccoli and cauliflower. Broccoli, along with any seedless variety of fruit (including what you think of as bananas), and most of the crops grown on farms today would not exist without human intervention. However, these aren’t the plants that people typically think of when they think of GMOs. It’s easy to understand how farmers can breed better plants on farms (by choosing to plant seeds from the biggest or best-yielding plants, for example, imposing artificial selection on the crop species) so even though this activity changes plant genomes in ways nature wouldn’t have, most people don’t consider these plants GMOs. 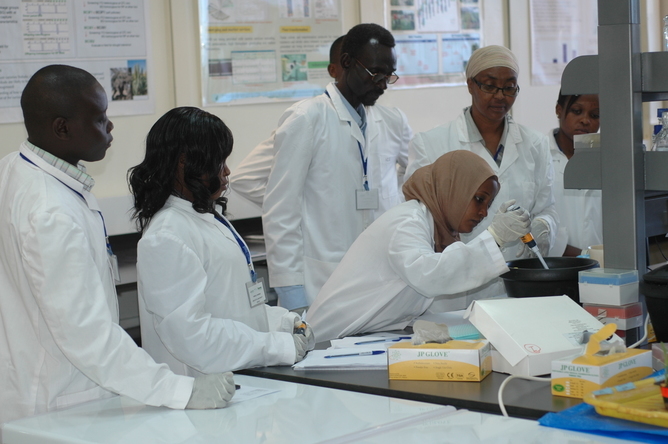 Scientists training in marker-assisted backcrossing selection technique. Once plant genes had been studied enough, researchers could turn to backcrossing. This technique involves breeding the offspring back with the parents to try to get a desired, stable combination of parental traits. Genes previously linked to desirable plant traits, such as higher yield or pest-resistance, could be identified and screened for using molecular biology techniques and linkage maps. These maps lay out the relative position of genes along a chromosome, based on how often they are passed along together to offspring. Closer genes tend to travel together. 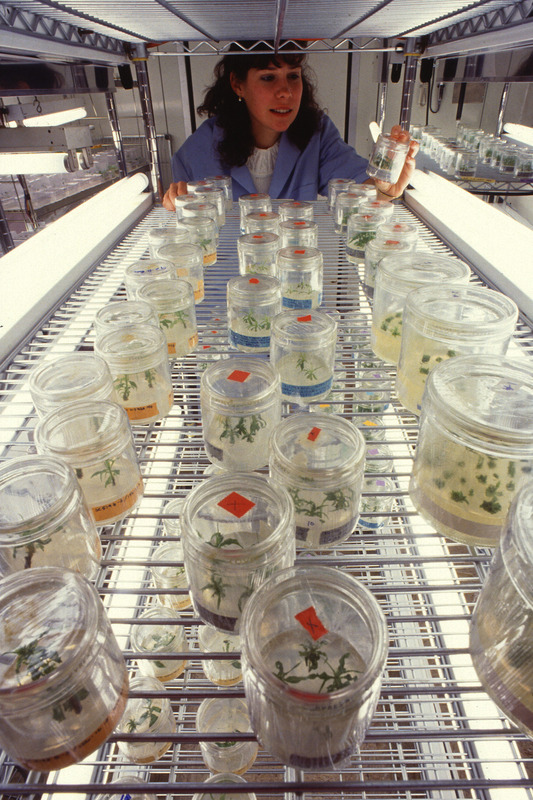 Tiny experimental trees grown from lab-cultured cells in which researchers inserted new genes. Researchers used molecular markers – specific, known gene sequences, present in the linkage maps – to select individual plants that contained both the new marker gene and the greatest proportion of other favorable genes from the parents. The combinations of genes passed to offspring are always due to random recombination of the parents’ genes. Researchers weren’t able to drive particular combinations themselves, they had to work with what arose naturally; so in this marker-assisted selection approach, there’s a lot of effort and time spent trying to find plants with the best combinations of genes. In this system, a laboratory needs to screen the genomes, using molecular biology methods to look for particular gene sequences for desirable traits in the bred offspring. Sometimes a lab even breeds the plants in cases using tissue culture – a way to propagate many plants simultaneously while minimizing the resources needed to grow them. 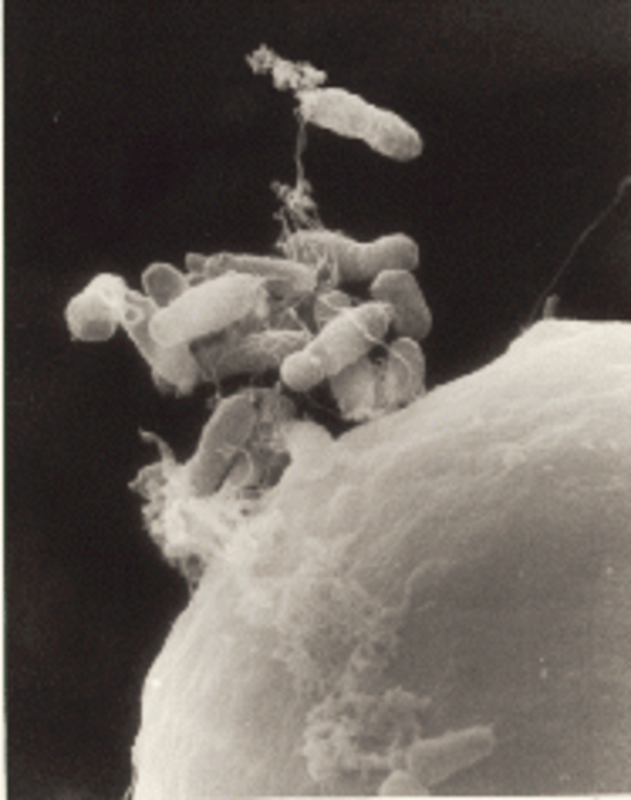 In the early 1980s, the plant biotechnology era began with Agrobacterium tumifaciens. This bacterium naturally infects plants and, in the wild, creates tumors by transferring DNA between itself and the plant it has infected. Scientists use this natural property to transfer genes to plant cells from an A. tumifaciens bacterium modified to contain a gene of interest. Agrobacterium tumefaciens as they begin to infect a carrot cell. For the first time, it was possible to insert specific genes into a plant genome, even genes that do not come from that species – or even from a plant. 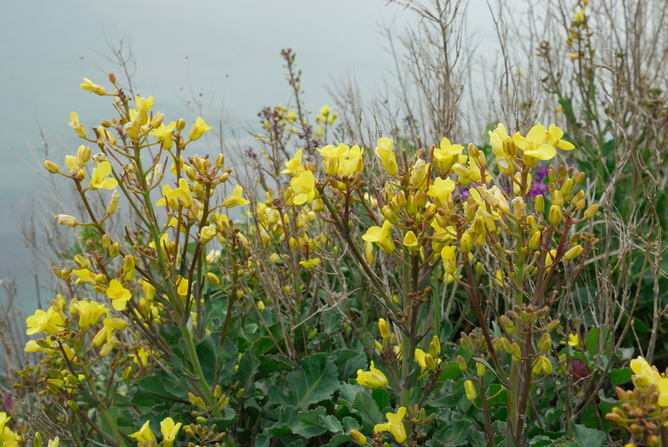 A. tumifaciens does not affect all plants, however, so researchers went on to develop DNA-transferring methods inspired by this system which would work without it. They include microinjection and “gene guns,” where the desired DNA was physically injected into the plant, or covered tiny particles that were literally shot into the nuclei of plant cells. A recent review summarizes eight new methods for altering genes in plants. These are molecular biology techniques that use different enzymes or nucleic acid molecules (DNA and RNA) to make changes to a plant’s genes. One route is to alter the sequence of a plant’s DNA. Another is to leave the sequence alone but make other epigenetic modifications to the structure of a plant’s DNA. For instance, scientists could add arrangements of atoms called methyl groups to some of the nucleotide building blocks of DNA. These epigenetic modifications, while not altering the order of the DNA or of genes, change how genes can be expressed and thus the observable traits a plant has. Calling a plant a genetically modified organism means only that – its genome has been modified by the activity of humans. But lots of people conflate the idea of a GMO plant with one that’s been created to be resistant to the herbicide glyphosate, also known by the brand name Roundup. It’s true that the most well-known GMO crops currently grown contain a gene that makes them resistant to glyphosate, which allows farmers to spray the chemical to kill weeds while allowing their crop to grow. But that’s just one example of a gene inserted into a plant. It’s sensible to evaluate GMOs not on how they are made, but rather on what new traits the modified plants have. For instance, while it can be argued that glyphosate resistance in plants is not good for the environment because of increased use of the pesticide, other GMOs are unlikely to cause this problem. Golden rice (on the right) compared to white rice. 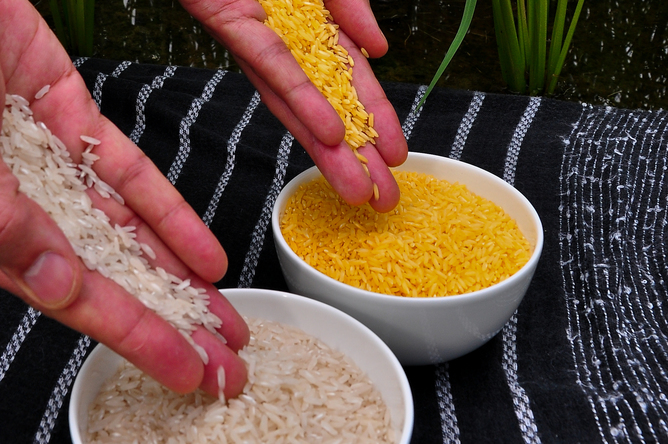 For example, it’s difficult see how the controversial golden rice, which has been engineered to produce vitamin A in the rice grains to be more nutritious, is worse for the environment than ordinary rice. GMOs have been developed to express a pesticide permitted in organic farming: Bt toxin, an insecticide naturally produced by the bacterium Bacillus thuringiensis. While this may reduce pesticide use, it may also lead to the evolution of Bt-resistant insects. And there are GMOs which have improved storage characteristics or nutritional content, like “Flavr Savr” tomatoes, or pineapples that contain lycopene, and tomatoes that contain anthocyanins. These compounds are ordinarily found in other fruits and are thought to have health benefits. GMOs that include different species’ genes make some people uncomfortable. The so-called “fish tomato” contains an antifreeze protein (gene name afa3), found naturally in winter flounder, that increases frost tolerance in the tomato plant. The tomato doesn’t actually contain fish tissue, or even necessarily DNA taken from fish tissue – just DNA of the same sequence present in the fish genome. The Afa3 protein is produced from the afa3 gene in the tomato cells using the same machinery as other tomato proteins. Is there any fish in the tomato plant? Whether DNA taken from one organism and put into another can change the species of the recipient organism is an interesting philosophical debate. 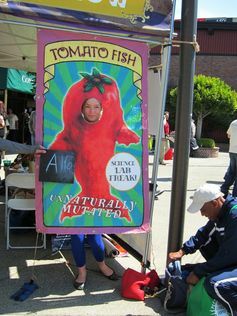 If a single gene from a fish can make a “fish tomato” a non-plant, are we human beings, who naturally contain over a hundred non-human genes, truly human?